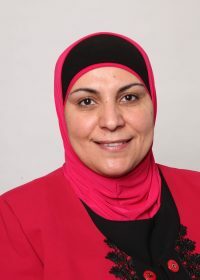 Majeda is the Chief Nursing Officer at King Hussein Cancer Center (KHCC) in Jordan. Her role includes leading and managing all nursing services at the center. King Hussein Cancer Center is the first hospital in Jordan to start the journey toward Magnet® excellence. Majeda is leading this journey with help and support from her team. She is a certificate holder from the American Nurses Credentialing Center in Fundamentals of Magnet®. Majeda established shared governance for the nurses at KHCC, and she continues to monitor and evaluate all related structures and processes. She has published that experience, in addition to other publications in nursing leadership and oncology care. Majeda received her doctorate at the University of Jordan. On a national level, she has served as a member of the executive board for the Jordanian Nursing Council. She has delivered many invited presentations in national and international professional meetings. In 2013, she was a winner for HRH Princess Mona AlHussien Award for Nursing Leadership & Management in Jordan (Rufaida Alaslamiah Medal). Majeeda’s Interview from Robert G Hess Jr on Vimeo.